On Tuesday 12th May Lama Jampa Thaye visited Colne to give a public talk to mark the 21st anniversary of Kagyu Dzong, the area's oldest Buddhist group. Seventy people attended the event, set in Colne’s Municipal Hall. 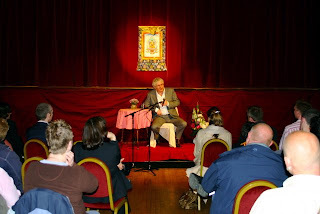 In his inspiring talk Lama Jampa conveyed the essence of the Buddhist path with clarity. This event was the third public talk that Lama Jampa has given in the North this year and was an auspicious occasion to celebrate this anniversary.